Folk Alliance Region Midwest (FARM) is a regional chapter of Folk Alliance International (FAI). Our purposes are to promote traditional, contemporary and multi-cultural folk music and dance and related performing arts in our region, hold an annual regional conference, represent the interests of our members to FAI and carry out such other projects as are of benefit to FAI members in the Midwest. Illinois, Indiana, Iowa, Kansas, Manitoba, Michigan, Minnesota, Missouri, Nebraska, Nunivut, North Dakota, Ohio, Saskatchewan, South Dakota, Wisconsin. The Midwest and Canadian Prairies are ripe with an urgent independent spirit lurking in all of its corners. It is first and foremost our goal to nurture this spirit throughout the Midwest and Prairies by doing all we can to foster a sense of community among our members. As members of a community, we believe in helping each other to develop skills, build networks, and find ways to present our art in both traditional and non-traditional venues. We encourage presenters to cooperate in booking touring musicians and we encourage touring musicians to assist each other along the way. It makes sense for all of us, performers and presenters alike, to come together as often as we can to meet, talk, learn from, dance and sing with each other. Together we will continue to promote the growth of the ever changing world of folk music and dance for future generations. This is the spirit found at our annual FARM gatherings. We invite you to participate by attending our conference, contributing your talents or otherwise reaching out to this supportive community. Folk Alliance Region Midwest is currently incorporated in the State of Michigan. Click here to download a copy of our current Bylaws. Some say it was 1991 others 1992 but either way, FARM as an organization was conceived and the first gathering happened about 26 years ago in Aurora, Illinois. A handful of folks who had just attended the Folk Alliance Conference which was held that year in Chicago, took the first steps to form what would become the Midwest Regional Folk Alliance. In order to preserve our history and honor the founding members, our dear departed Board member and Secretary, Christine Gaylord, asked a few of them to share their early recollections. You can read those by clicking the links below. You will also find our past board members, award honorees and showcase artists listed in various places throughout the site. When did we start having the conferences? and where have they been located from the beginning one through 1997? We started in 1991 (after the National Conference was in Chicago in February). Who had the original idea and why did we start having the conferences? The big conference (not so big then) was in Chicago in February 1991. The next few were going to be far away from Chicago and we felt the one hour regional meeting was valuable and should be continued. That year, I believe Saturday dinner and the showcases were in the same room – anyway, there were big round tables. We continued to meet after the regional session, and decided to hold the conference. Ten of us each put $10 on the table as seed money. Now I bet you want me to remember who was at the table. You’d better check with a lot more people on this. Phyllis Barney – she was living in LaCrosse at the time. Who have been the movers and shakers for the conferences up until 1999? Was there an initial “mission” statement? I don’t think we were that formal. We wanted to put on a conference. My own recollections of the early conferences are hazy, as I was an attendee, not a mover/shaker. I first attended in 1992 at the Travel Lodge in Aurora, and in 1993 at East Lansing. I remember Phyllis attending those conferences, and I vividly recall the open mikes and workshop sessions with Lee Murdock and Joann, Mike Yuhas, Mark Dvorak, and others. I remember Joan, how busy she always seemed. Now I know why. The East Lansing conference was a little different – the conference was at a school, and the motels were several blocks away. Tom Paxton was the keynote speaker at lunch, and he sat around with us after lunch talking about songs. Also, it was the weekend of the Ohio State-Michigan game. In 1994, I had basically stopped touring and was busy in Cleveland with family stuff, but remained an FA member and was a general member of Folknet, our local folk org. In 1998, I knew that the regional conference was supposed to be held in Cleveland, and I wanted to be part of that. I made some inquiries and went to a meeting of Folknet, only to find that the local person involved early in the planning had reserved the Holiday Inn in Wadsworth, Ohio for the conference. This was not what the Midwest folks had in mind – they were hoping for a Cleveland setting anticipating the 2000 International Conference there. Wadsworth is in Medina County – a long way from the airport and from just about everything else. By this time, though (May 1998) it was too late to book a new site in the Cleveland area. The person who had booked the Wadsworth site had dropped out of the planning committee in a huff. We decided to go ahead with Wadsworth since nothing else seemed feasible. I recall many many emails on the subject and much straining of our collective patience. Victoria Parks took over chairing the local site preparation, and I volunteered to help her with some of that. Probably due to its obscurity and a civil war in the Cleveland folk community, the 1998 Wadsworth conference was the most sparsely attended in our history (58 attended) and it was the only one ever to lose money. However, Victoria did a terrific job, having had the whole project dumped in her lap at a very late date. At that point (post conference 1998) the Midwest movers and shakers, who included Phil and Althea Doolittle, Joan Hellmann, Joel Mabus, et. al (and perhaps Dev Singh?) – decided wisely that it might be a good idea to form a board to plan these conferences instead of doing it with an ad hoc committee every year. FARM was formed, and one of the new board members was Susan Weber. The 1999 Conference was planned for Lake Geneva (George Williams Conference Center). I attended that conference. When Susan decided not to seek reelection to the board, somehow my name was mentioned to replace her, which I accepted. During this time (1999-2000) I was also president of Folknet in Cleveland. I served on the board fro two years (2000 and 2001), and remain active as the FARM Finance committee chair. It is my job to compile the financial statements sent each year to assure FARM’s inclusion in the Folk Alliance Group Exemption. We have come a long way since those early days. Hopefully we can continue to keep the Folk Alliance mission growing and active in the Midwest. You were asking about some of the early Midwestern gatherings. The first two were held in Aurora, Illinois at a holiday inn that has now changed hands many times and is a shadow if its former self. It has shag carpeting downstairs where we had the song circles that probably had mold from the ages in it already. It made you think you were sitting in somebody’s ’70’s era hippy van. The first year mostly had people talking in conference rooms about various aspects of getting ahead in folk music. Nothing really formally presented. The evening went on with a song circle, rather than anything organized. There also wasn’t much of a registration fee. However, mostly folks from the Chicago area came. The second year was in the same place. The panels started to take form. I remember blowing off some of the panels to jam outside on the lawn with other musicians. The second year also had a really nice Friday night song circle. It started small with Margaret and me and a few fox valley folklore society members. I recall Kathy Folkerts coming in and singing a very nice version of “The Wee Weaver” as one of the highlights of that evening. I missed the next couple years, but they had moved the conference to Lansing, Michigan and to Madison, Wisconsin somewhere (they were in Madison twice, so not to confuse the two). I heard stories on the first Madison conference of an all night party in someone’s room that was the stuff of legends (I’m not telling who did what, since I wasn’t there). The conference came back to Aurora again, this time more organized. Mike Fleischer and Mike Yuhas organized an open mic (sort of the beginning of what we do now). After that was another trip to Madison, where the conference was fine, but the hotel wouldn’t allow jamming after hours. That year jam sessions happened at various people’s homes after the open stage. That was a sleep deprivation year. The following year the conference went to Grand Rapids, Michigan. I have fond memories of searching for greasy diners for breakfast. Jamming at the hotel allowed. I’m sure Margaret and I did panels, but I don’t recall on what topics. Then came Wadsworth, Ohio – the last hotel conference. While I enjoyed going there and had fun there was an undercurrent of tension because of some frictions in the local presenting organization. That’s when I recall the notion of a board coming up. I think there’s plenty of people who can give you fond remembrances of the first couple Lake Geneva conferences (the cold parking lot singing session the first year, etc). Last year I had fond memories of blowing off the peer group sessions to play Irish tunes by the lake. It seems most years I enjoy finding folks to blow off peer group sessions and play tunes (playing music together is something that should be fostered after all). Things have been quiet on this list lately — unlike the greater world. Just wanted to make a quick report that the 11th annual FARM Gathering (that’s Folk Alliance Region Midwest = FARM) was another success. Held the weekend before this last one at The Kellogg Biological Station (KBS) in Hickory Corners Michigan. This spot will also be the site for next year’s gathering. The board is still scouting for a third location further to the south and west than this and the other site in rotation in Lake Geneva, Wis. KBS is a perfectly lovely spot for FARM. It was once the summer mansion for the Kellogg corn flake magnate, on lovely Gull Lake in Kalamazoo County. Kellogg turned it over to Michigan State University some 50 years ago. MSU has developed the place into a research and conference facility, with dorms, apartments and cabins for visitors, a nice cafeteria/kitchen and a nicely sized auditorium along with smaller meeting rooms. True to its tradition, FARM eschewed the idea of “showcasing” and instead offered a two-night open mike so that everybody got a turn on stage that wanted one. Kitty Donohoe sang her new song “There Are No Words” written in the aftermath of the attack on NY/DC — a highpoint among many others. Folks from Illinois offered a scholarship program for an Illinois teenager to attend without cost to her — a young tinwhistle player who charmed us all. Meetings in the day were eagerly attended and the late night jams and song circles were especially vigorous this year. It was indeed a good time to gather. This email is in no way the “official report” or anything — I just wanted to let folks in the alliance know that our event came off, even in this month of nervous travelers. When I first attended FARM it was being held at Lake Geneva, Wisconsin. At this time it was rotating every two years between Lake Geneva and Battle Creek, MI. I was conscripted to join the board somewhere during the first sojourn at Battle Creek and served for two years as treasurer. 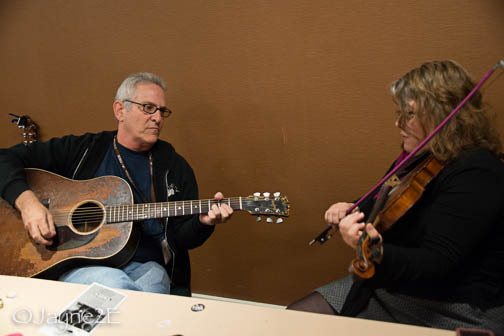 During my time as a board member a survey of the entire Midwest Folk Alliance membership brought us to the conclusion that folks wanted us to add formal showcases as a part of the conference and we voted to make that change. While showcases are fine, my fondest memories are of the wonderful late to all-night song circles that occur every single year and the beautiful friendships I’ve formed. One good memory is of a conference at Battle Creek when the songwriters song circle I was in got too large to seem manageable and I went searching for something more intimate. I heard this gorgeous music coming from the men’s room and upon entering discovered, among others David Mosier, Beth and Dan Lodge Rigal, Tom Gorman and I believe Bud Michaels and Catherine Ellis all playing between the stalls and this gorgeous sound reverberating off the tiles. We stayed there till the wee hours sharing tunes while surprised individuals came in to use the facility and decided to look for another rest room. Every year there are new surprising and memorable moments I will cherish always. Former Director of Folk Alliance International, Louis J. Meyers passed away far too soon at the age of 61. He’s known in the folk and bluegrass world first as one of the founders of SXSW, before moving on to become the executive director of Folk Alliance International. I have many fond memories of Louis as someone who was a huge support to me during my tenure as President and conference director of FARM. He was encouraging and enthusiastic as we started to grow. He came to FARM a number of times but never drew attention to himself. Just loved to sit and pick with the performers, of which, he was also one. Our long-time dedicated FARM Board Secretary and member, Christine Gaylord, “graduated” from this life Thursday night, August 6, 2009, peacefully at home surrounded by caregivers, family and friends, serenaded with the music she loved by her church’s band, of which she was a prominent member. Memorial service information to follow shortly; a special segment of WDCB’s Tuesday Night “Folk Festival” in her memory, featuring the music of her band Gallimaufry, will be aired on August 18 between 7 and 9 pm CDT. Her family suggests any donations in her memory be made to the Moody Bible Institute, which she supported. She was also an enthusiastic supporter of the Illinois Bluegrass Musicians’ Association. Our sincere condolences to Carol and her family.